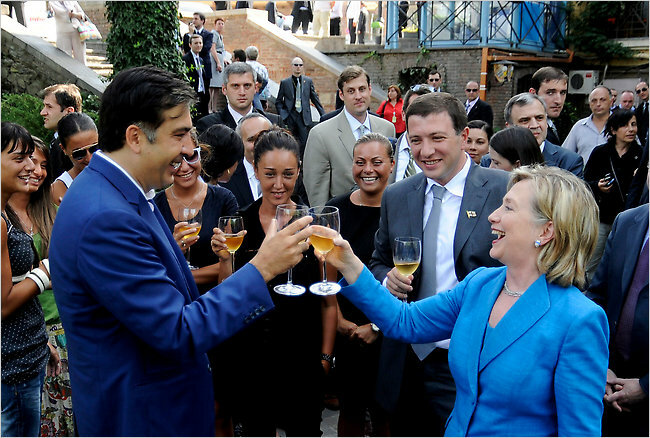 Russians were appalled and terrified last week to see U.S. Secretary of State Hillary Clinton in Tbilisi drinking a toast with the Kremlin’s public enemy #1, Georgian President Mikheil Saakashvili. They denied it, of course. Just the same way that, a few days earlier, they had denied the spies arrested in the United States were Russian. Soon, however, they were forced to admit their denials were pathetic lies, and that the spies were in fact Russian citizens. Soon, they were bartering for the release of those spies they said did not exist. We can imagine the thoughts racing through the rodent-like “minds” of the KGB spies who rule the Kremlin, the same spies whose pathetic plans were exposed in the United States, when viewing the photograph at the head of this column.